The GRIT Report published by Greenbook is known for being one of the most comprehensive surveys of current trends in the marketing research industry. This year, for the first time ever, they shifted their traditional focus to include an in-depth look at the post-graduate educational programs in the United States that are solely focused on marketing research. When asking their respondents to name which programs or universities came to mind when they think of post-graduate marketing research programs, Michigan State University’s Master of Science in Marketing Research was one of the most mentioned, alongside the University of Georgia’s MMR program. According to the GRIT report the top four major programs named are the leaders for post-graduate program brand awareness. In terms of what respondents found important to a program, the top answers were experience, application, understanding and practical data. Aside from these aspects, critical thinking and insight development were named as the top two critical skills to conquer in a graduate program. All of these areas in which the MSMR program strives to educate their students on for ease of real-life application outside of the classroom. 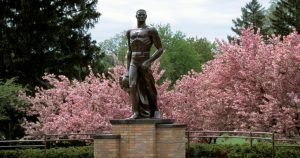 When it comes to perceptions of the graduate programs, Michigan State was one of the most highly ranked programs. The report outlines that the universities mentioned have acclaimed a global recognition and that there are many opportunities to spread more awareness and understanding of just how great these marketing research programs are. Who Will? Marketing Research Spartans Will!